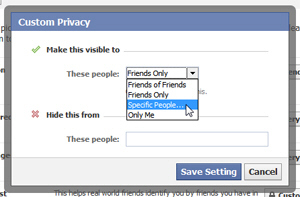 Click on the "Account" dropdown menu in your Facebook profile, and choose "Privacy Settings". To hide your employer and school information from everyone, simply choose "Only Me". To show this information only to certain Facebook users, choose "Specific People" from the dropdown menu as shown above, and type the names of the people (Facebook users) who should be allowed to see this information. Likewise, you can specifically prevent people (like your current boss) from seeing job and education data on your profile. Just type under "Hide this from" all the names of the users who should not be able to view this information. Click on "Save Settings" when you have finished allowing or blocking users for work and education. You are done: Facebook saves and applies the change in setting right away. You can now click on the "Back to Privacy" button, or "Preview My Profile", or close this window.